Blockchain Technology in Healthcare Market size is set to exceed USD 1,636.7 million by 2025; according to a new research study published by Global Market Insights, Inc.
Increase in cost savings for several healthcare applications with the help of blockchain technology will drive the business growth in the forthcoming years. Blockchain is a recognized technology that is helping healthcare facilities save huge amount of money from frauds, counterfeit drugs and hence, positively impact the outcomes of healthcare. Healthcare data breaches cost around USD 380 per patient record, resulting in high annual losses. Hence, implementation of blockchain technology in healthcare will help save billions of dollars. Lack of skilled workforce will be one the major factors responsible for impeding the growth of blockchain technology in healthcare market in the near future. Limited number of people with blockchain technology knowledge and lack of blockchain training, programs and courses will result in sluggish business growth. Application of blockchain technology in clinical trials was valued around USD 6.9 million in the year 2018. The amount of risk involved, and unpredictability of clinical trials is one of the major drivers for implementing blockchain technology in healthcare. The blockchain technology in clinical trials use distributed computer network platform that helps databases to be secure and safe from infringements and hackers. The safe and secure platform of blockchain will help store and process valuable information of clinical trials resulting in smooth workflow thereby, influencing the market growth positively. Germany dominated the Europe blockchain technology in healthcare market and was valued at around USD 2.9 million in the year 2018. Various companies and cities in the country are turning into development hub for blockchain technology. Several German firms are planning to integrate and implement blockchain technology due to increased automation, efficiency and speed. Pharma giant Merck is currently investigating the use of blockchain technology in healthcare for setting up registries of vaccines and transactional histories for patients. Growing demand and adoption rate in the country will boost the market growth in near future. 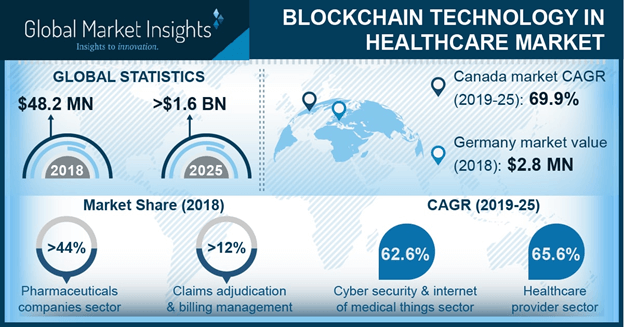 India blockchain technology in healthcare market is projected to witness a growth of 81.9% over the estimation period. Rise in application in clinical data exchange and data security in the country has resulted in increased privacy, security and interoperability of health data. Also, use of blockchain technology in health insurance claims management in the country will augment the market growth in the near future.